Glowing road markings light the way. Volvo Construction Equipment takes a trip to the roads of the future by looking at some incredible innovations and indicating how design, materials and use will be adapted in the years to come. In the past 50 years, there have been huge advancements in the automobile industry but the roads we drive on have remained nearly unchanged. As cars get smarter so too should the infrastructure that supports them. Our road network continues to be expanded and by 2050, the global network of highways is projected to increase by 60 per cent. So, in the drive towards sustainability and smarter roads, what are some of the innovative roads that we can expect to see in the future? Concrete production contributes to eight per cent of global carbon dioxide (CO2) emissions, according to the World Wildlife Fund (WWF). It is made from quarried aggregates – such as limestone, granite or sand – bound with cement, bitumen (asphalt) or other agents. But what if we replace these finite resources with one of humanity’s infamous byproducts, such as plastic? India has been filling potholes using plastic as a binder on a small scale for years. UK engineer Toby McCartney has even developed a way to turn recycled plastic into pellets that can be added to asphalt to decrease the use of binders. You need three to 10 kg of recycled plastic per tonne of paved asphalt. This process makes the road considerably stronger and last much longer than traditional material. Cumbria in the UK adopted this for all new roadways. But life in plastic isn’t always fantastic. As roads break down, small micro-particles of plastic are released into the surrounding environment and can have detrimental impacts on wildlife and human health. Jigsaw roads ... the hollow design allows for pipes and cables to be installed with ease. 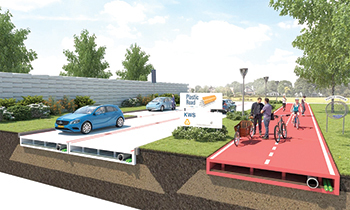 Dutch company KWS partnered with Wavin and Total to develop PlasticRoad – a prefabricated, modular roadway made from recycled plastic. The modular-fitted pieces make it 70 per cent faster to build whilst the plastic hollow design makes it four times lighter than asphalt. The hollow design also allows for pipes and cables to be installed without extensive digging and has the capacity to store excess water during storms and floods. The trial phase began last September with the opening of a bike path in the Netherlands. With the huge advancements in technology in the car industry, it’s important to note the role road markings already play in modern vehicles. Many cars with autopilot functions rely on these markings to help centre the vehicle on the road. In bad weather conditions or in low light, it can be hard for both car and driver to see the markings, but this could all soon change. On a small stretch of road in the Netherlands, streetlights have been replaced with glow-in-the-dark lines, which guide drivers. This simple but effective innovation was the brainchild of designer Daan Roosegaarde. During the day, these fluorescent strips absorb sunlight and at night this light is emitted back out again. Replacing streetlights – especially on less travelled roads – provides a sustainable solution without jeopardising the driver’s safety. 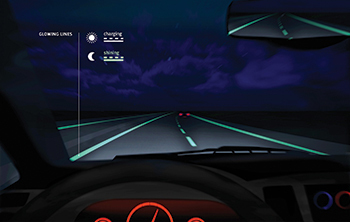 Roosegaarde is also looking to create road warning marks out of temperature-sensitive paint. The margins will illuminate when triggered by a drop-in temperature, for example, warning drivers of icy patches on the road ahead. Similar technology is being incorporated into asphalt to create glowing cycle paths and small stretches of path. This could be a common sight for evening commuters in the future. The UK alone has spent £40 billion ($52.3 billion) a year on the repair and maintenance of existing, mainly concrete, structures. This has contributed significantly to CO2 emissions from cement manufacturing. But what if concrete could literally heal itself? Self-healing materials were voted one of the top 10 emerging technologies by the World Economic Forum. Previously, this technology was only really explored by the aerospace industry, but its potential widespread use in the concrete construction industry has driven more extensive research. In 2013, researchers at the University of Bath, Cardiff and Cambridge joined forces to create a new generation of ‘smart’ concrete and other cement-based construction materials. As part of the project, researchers are developing a concrete mix that contains bacteria encompassed in microcapsules, which will propagate when water enters a crack in the concrete. This then produces limestone (calcite), plugging the crack before water and oxygen corrode the steel reinforcement below. Self-healing concrete is estimated to reduce lifetime costs by up to 50 per cent. The same concept is being used in asphalt where microscopic capsules containing a rejuvenator can be used to enhance the self-healing capability of the material. About 60 per cent of carbon pollution from the transportation sector comes from passenger vehicles. If we electrify all of them with renewably generated, zero-carbon electricity, this could have a huge impact on reducing carbon emissions. However, the big issue with electric vehicles at present is the time they take to charge. Electric cars like the Tesla Model S can travel more than 250 miles (402 km) on a single charge, but recharging can take up to 25 hours. However, research is being done on electrified roads, which would allow electric vehicle drivers to charge on-the-go. Some research is looking into wireless charging while others are looking into cable contact charging where – not unlike a life-size Scalextric slot car – cars will charge by maintaining contact with charging coils on the road. Early models suggest that installing charging coils in 10 per cent of our roadways will extend the driving range of electric vehicles from an average of 94 to 480 km.